I started my business over 20 years ago after studying at the Scottish College of Textiles, Galashiels and gaining experience in the clothing industry. 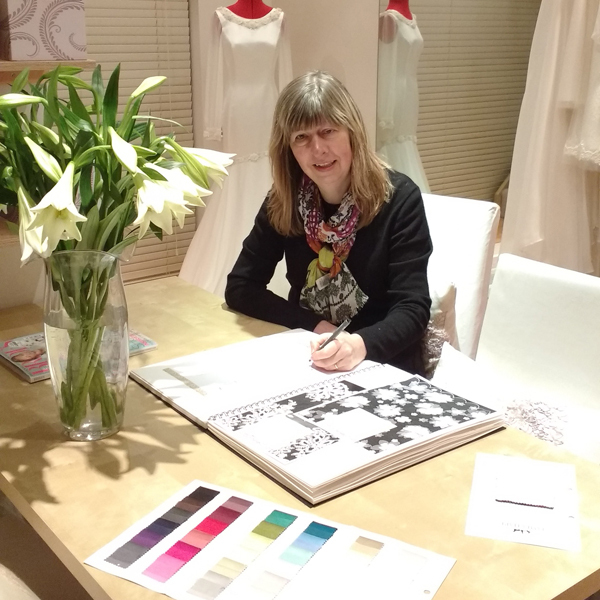 From an early age I loved to make clothes and have always enjoyed not only the design, but all the technical processes which go into making a bespoke gown. I work from my studio which is divided into two parts. Downstairs is the area where brides can try on gowns which is full of inspiration from gowns, sketches, designs in development, fabrics, laces, amazing trimmings to bridal magazines. Upstairs is where I make the gowns in a lovely bright work space. It is a pleasure and a privilege not only to make a bride’s gown but to get to know them throughout the process. I love to watch how the design evolves throughout the process between the bride to be and myself. I enjoy the process of getting the perfect fit and adding detail to make each gown special to the individual bride to be. I take pride in creating unique gowns with couture fit but at an affordable price.